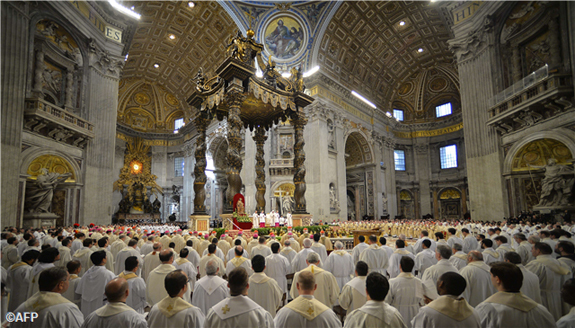 This morning in St. Peter’s Basilica, Pope Francis celebrated the traditional Chrism Mass with the priests of the Diocese of Rome as well as bishops and cardinals residing in the Eternal City. The Chrism Mass, which is celebrated by the diocesan bishop during Holy Week and includes diocesan priests renewing the vows first made at their ordination, also features the blessing of the holy oils that will be used for the sacraments throughout the rest of the year. 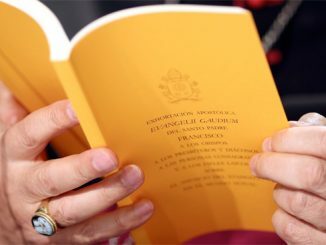 Below is the full text of Pope Francis’ homily from this morning’s Chrism Mass, addressed to his “brother priests” (English translation via Vatican Radio). On this priestly Thursday I ask the Lord Jesus to preserve the joy sparkling in the eyes of the recently ordained who go forth to devour the world, to spend themselves fully in the midst of God’s faithful people, rejoicing as they prepare their first homily, their first Mass, their first Baptism, their first confession… It is the joy of being able to share with wonder, and for the first time as God’s anointed, the treasure of the Gospel and to feel the faithful people anointing you again and in yet another way: by their requests, by bowing their heads for your blessing, by taking your hands, by bringing you their children, by pleading for their sick… Preserve, Lord, in your young priests the joy of going forth, of doing everything as if for the first time, the joy of spending their lives fully for you.